Sculptapalooza Sculpting Party Game | Nerd Much? New from Educational Insights and available now is Sculptapalooza, the squishy squashy sculpting party game. It’s the fun addition to your party game night you didn’t know you were missing. 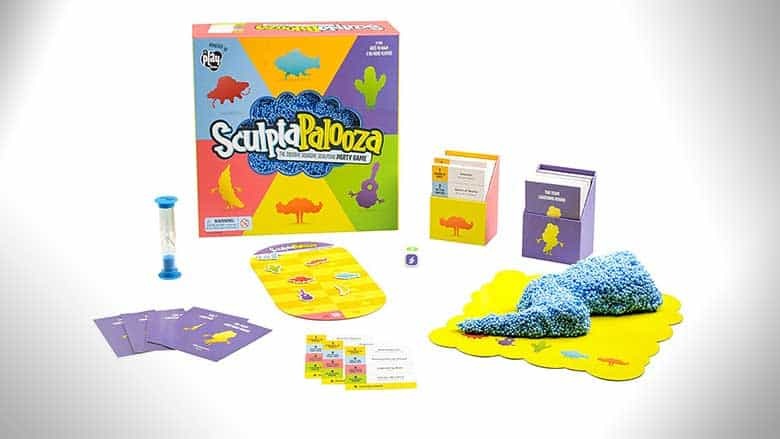 Gather friends and family alike and start a rousing and hilarious game of Sculptapalooza the next time there is a lull at your gathering. What better way to break the ice than a fun and creative game that features that awesome bestselling Playfoam. We could all use an excuse to play with foam every now and then, and this is the perfect cover. The game begins by dividing into 2 teams, the first team rolls the die to determine its sculpting category. When ready to begin simply flip the timer, and sculpt whatever was shown on the card. If your team guesses correctly before the timer runs out, you win a point. The first team to reach 20 points wins the game, and bragging rights! Teams race against the clock to sculpt their way through four different crazy categories. Gameplay categories include: 1. Straight up sculpt, 2. Put it on your face, 3. Just close your eyes, 4. Play foam props. This fast-paced game even features tag-team play in the bonus lightning round. The game set includes the play foam, sculpting mat, 220 cards, die, timer, scorecard, and game guide, not to mention endless hours of creative fun. Perfect for anyone age 10 and up, and it can work as both a family game with your kids or a fun game with friends. Are you a board game fanatic? Be sure to check out our list of the Best New Board Games of 2018!